curl is obviously an extremely popular way to experiment a REST API. Unfortunately one of its shortcoming is not able to remove a custom header but just to modify or add it. In swift if you prefix your Meta header with X-remove it would then just do that and remove the header. and the X-Account-Meta-Quota-Bytes header was removed. It is easy to launch the swift functional tests with v2 auth (Keystone). add a tenant/user named test/tester. add a tenant/user name test2/tester2. add a user tester3 belonging to test2 but not operator on that tenant. and the functional tests will run against a keystone server (or a auth v2 api compatible server). PKI tokens has been implemented in keystone by Adam Young and others and was shipped for the OpenStack grizlly release. It is available since the version 2.0 API of keystone. Public-key cryptography is a cryptographic technique that enables users to securely communicate on an insecure public network, and reliably verify the identity of a user via digital signatures. As described more lengthy on this IBM blog post keystone will start to generate a public and a private key and store it locally. When getting the first request the service (i.e: Swift) will go get the public certificate from keystone and store it locally for later use. When the user is authenticated and a PKI token needs to be generated, keystone will take the private key and encrypt the token and the metadata (i.e: roles, endpoints, services). The service by the mean of the auth_token middleware will decrypt the token with the public key and get the info to pass on to the service it set the *keystone.identity* WSGI environement variable to be used by the other middleware of the service in the paste pipeline. The PKI tokens are then much more secure since the service can trust where the token is coming from and much more efficient since it doesn’t have to validate it on every request like done for UUID token. This bring us to the auth_token middleware. The auth token middleware is a central piece of software of keystone to provide a generic middleware for other python WSGI services to integrate with keystone. The auth_token middleware was moved in grizzly to the python-keystoneclient package, this allows us to don’t have to install a full keystone server package to use it (remember this is supposed to be integrated directly in services). You usually would add the auth_token middleware in your paste pipeline at the begining of it (there may be other middlewares before like logging, catch_errors and stuff so not quite the first one). There is much more options to the auth_token middleware, I invite you to refer to your service documentation and read a bit the top of the auth_token file here. When the service get a request with a X-Auth-Token header containing a PKI token the auth middleware will intercept it and start to do some works. It will validate the token by first md5/hexdigesting it, this is going to be the key in memcache as you may have seen the PKI token since containing all the metadatas can be very long and are too big to server as is for memcache. It will check if we have the key in memcache and if not start verify the signed token. Before everything the token is checked if it was revoked (see my previous article about PKI revoked tokens). The way it’s getting the revoked token is to first check if the token revocation list is expired (by default it will do a refresh for it every seconds). If it need to be refreshed it will do a request to the url ‘/v2.0/tokens/revoked‘ with an admin token to the keystone admin interface and get the list of revoked tokens. The list get stored as well on disk for easy retrieval. If the token is not revoked it will convert the token to a proper CMS format and start verifying it. Using the signing cert filename and the ca filename it will invoke the command line openssl CLI to do a cms -verify which will decode the cms token providing the decoded data. If the cert filename or the ca filename was missing it will fetch it again. Fetching the signing cert will be done by doing a non authenticated query to the keystone admin url ‘/v2.0/certificates/signing‘. Same goes for the ca making a query to the keystone url ‘/v2.0/certificates/ca‘. When we have the decoded data we can now build our environement variable for the other inside the environement variable call keystone.token_info this will be used next by the other services middleware. Bunch of new headers will be added to the request with for example the User Project ID Project Name etc.. 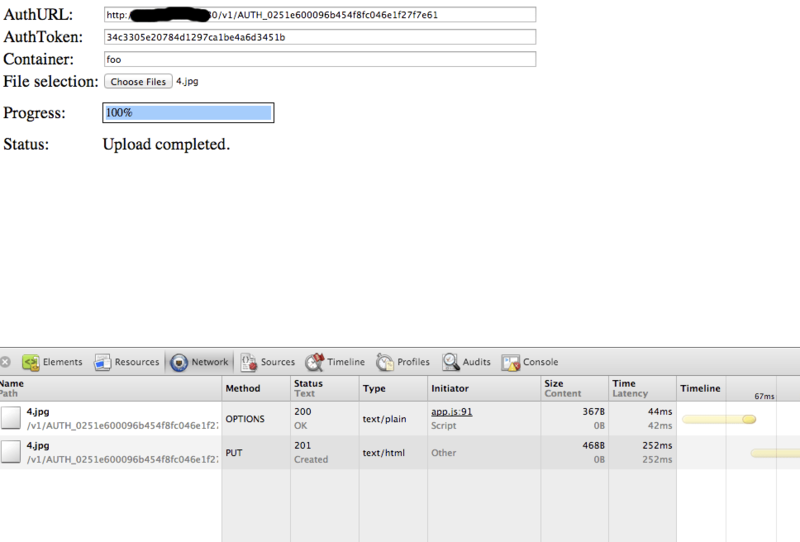 The md5/hexdigest PKI token is then stored with the data inside memcache. And that’s it, there is much more information on the IBM blog post and on Adam’s blog I am mentionning earlier. This is something I have been asked and I was at first under impression it was only available in v3, digging a bit more into the code there is actually a way to do that in v2 when you are using PKI tokens. Since I could not find much documentation online here is a description of the steps how to do it. it will give you a variable $TOKEN and a variable $STORAGE_URL that you can use further down. revocation list is fetched every seconds or so. This server could not verify that you are authorized to access the document you requested. bingo the token has been now revoked properly. Swift and quotas in upcoming 1.8.0 (Grizzly) release. There is two new nifty middlewares for doing quotas in upcoming Swift release 1.8.0 called container_quotas and account_quotas. Those are two different middlewares because they are actually addressing different use cases. container_quotas is typically used by end users the use case here is to let user to specify a limit on one of their container. Why would you want to restrict yourself you may ask ? This is because when you allow a public upload to a container for example with tempurl or/and formpost you want to make sure people are not uploading a unlimited amount of datas. X-Container-Meta-Quota-Bytes – The Maximum size of the container, in bytes. X-Account-Meta-Quota-Bytes – The Maximum size of the account in bytes. 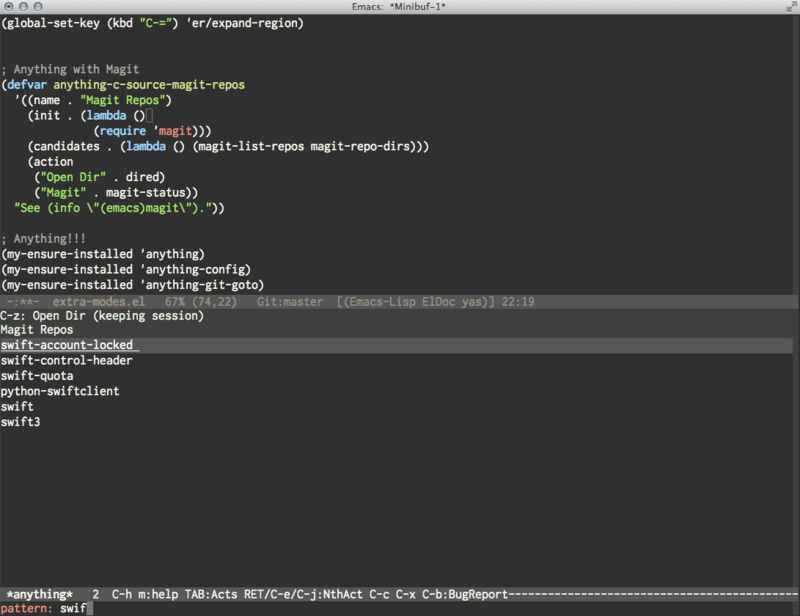 I have been using quite a bit the anything-mode for Emacs, it’s basically a Quicksilver/AlfredÂ or Gnome-doÂ for Emacs and allow to configure a lot of different sources to complete some chosen ‘source’with different actions. With my work on OpenStack I have found myself jumping a lot between git directories and due configured the variable ‘magit-repo-dirs for easy access to most of them easily. 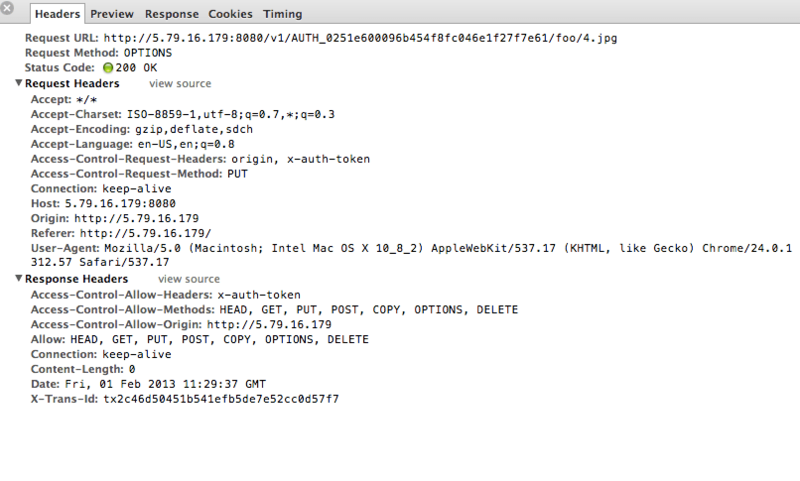 Upload to OpenStack Swift via CORS/HTML5 request. One of our client at eNovance had a need to be able to upload to Swift directly from a web browser without going via a PHP proxy. Things in browser-land are not exactly the same as what we have in user-land, it is a bit more restricted to ensure the end-user security and there is a few hoops to jumpÂ through to get it working. It says, hello there: my Origin: is this IP and I want to be able to access with this method ‘PUT’, can I do it ? The server will reply something along (if it’s allowed), yeah sure please feel free to send this headers along and those methods and Origin are actually what I am allowing. that was targetted to amazon s3 and I adapted it to use with OpenStack Swift. In belgium for Fosdem this weekend. With a team of colleagues from enovance we are going to be this week-end (2/3 Feb 2013) in Brussels for Fosdem. Feel free to catch me if you want to have a chat about Swift or OpenStack in general. I will be wearing a enovance woodie/t-shirt. And here is another year finishing and I am looking back how did I do with my fitness. I would have done much more if I didn’t have a bad upper shine when I was in australia where I was going to do a month of cycling. This year looks promising with the Madrid Marathon in april (going for around 3h20) and probably some pretty good cycling trips during the summer if shin/ankle get sorted, I am looking forward to 2013.